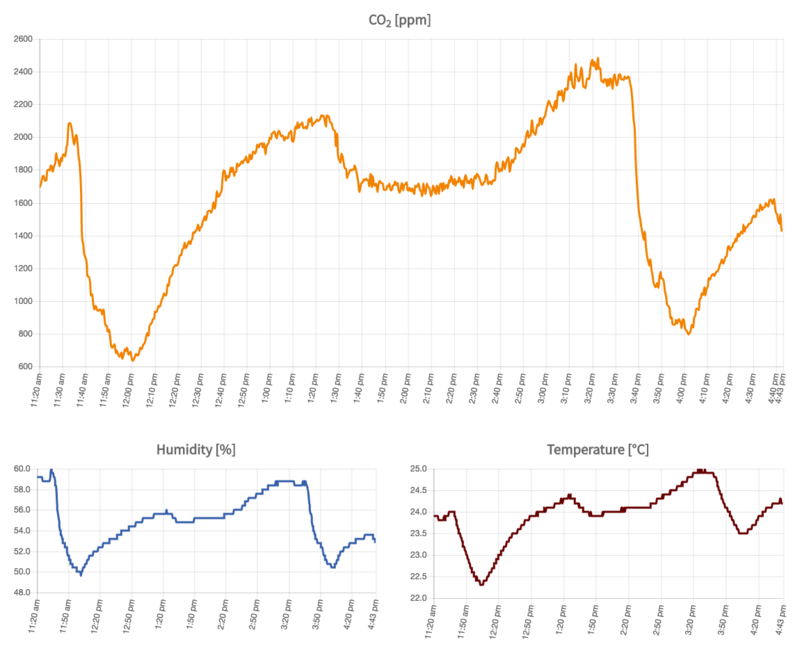 In this post I describe the overall experience, my impression of the talks, and share a story of one broken air quality monitoring sensor. The conference was hosted at Shoreditch Studios, in somewhat run-down but lively part of London. The two conference rooms were actually arches of an old train bridge with walls and doors on the side. One could hear the trains humming during talks. It was definitely one of the most original conference venues I’ve seen. When we entered the place on Monday, I was surprised how small the conference was — there were only about 150 participants. Based on the ongoing IoT hype and ThingMonk’s fame I expected much more (500+). The small size actually wasn’t a bad thing as it gave the conference a feel of tightly knit community where it was easy to talk to other participants and share problems and experiences. 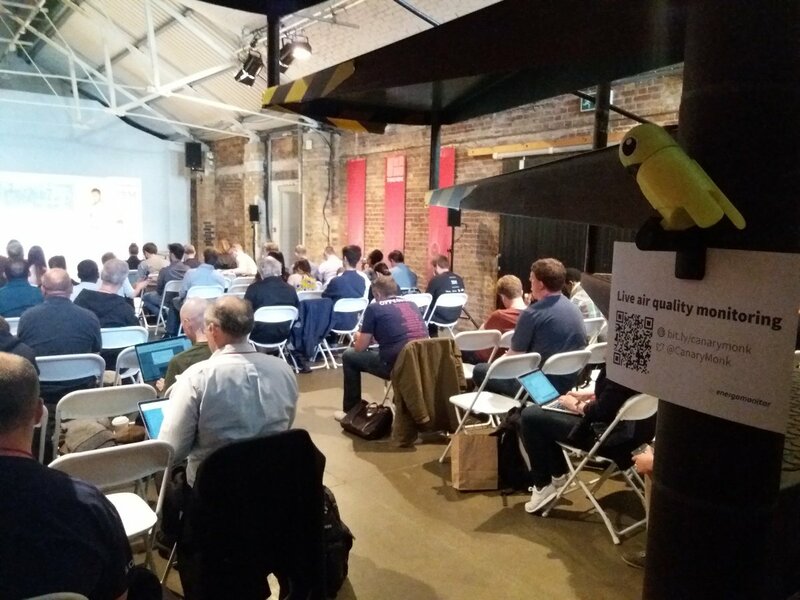 As an IoT conference, ThingMonk had its own flavor of BYOD (Bring Your Own Device). Normally, BYOD means bringing your personal iPad to work, but here it meant that people brought various gadgets and sensors which they hooked up, used for live demos during talks, etc. We were not an exception and brought Energomonitor’s new Airsense air quality sensor prototype with us. More on that below. I won’t do a review of each conference talk here, instead I’ll offer few general observations. Overall, the talks reflected the state of IoT as a whole. It’s clear that the basics of IoT are well established and it starts being applied in many areas. Big players such as IBM, Microsoft or Amazon invest into it heavily. On the other hand, there are still major unsolved problems (e.g. radio protocols and security, to name just two). There, a lot of work is needed to devise solutions and establish standards. Also, best practices are only starting to emerge. Unfortunately, some talks also felt like sales pitches. The lowest point was probably the Cloud Foundry introduction, which was not only too long for its content, but also pretty much irrelevant. Please, let’s not have these in next years! As an aside, the last talk is an example how to do a product promotion right. The talk was about the Azure messaging platform, but Clemens started in a general way, classifying various message types, describing their important properties, and only then he showed how all this is reflected in Azure’s services. As a result, the talk had a value by itself, even when one didn’t care about Azure much. We think of Airsense as a modern flavor of a coal mine canary and want to distribute it to schools (hence the playful looks). 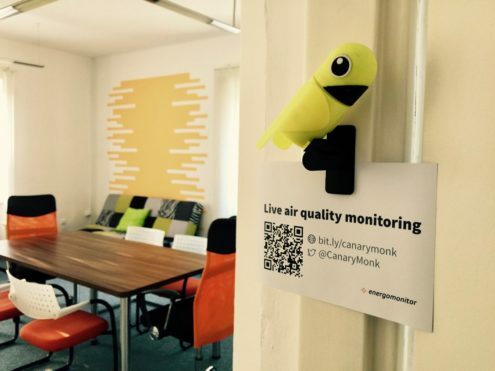 We wanted to set up Airsense in the main conference room and see how measured data correlates with breathability of air, whether breaks between the talks affect air quality, etc. Using Energomonitor’s API, our developer Michaela prepared a website showing the measured data live. (Side note: she was with our company for only 3 days when she started the work but nevertheless did an excellent job!) To bring some fun and interactivity, we also gave the sensor its own Twitter account. The colorful bird hanging on the stairs didn’t go unnoticed, as well as our cheeky tweets. People stopped to chat and high CO2 values we measured during one of the talk blocks were even mentioned on stage at one point. Several people even expressed the desire to have something like this at their conferences (hello, EclipseCon!). It was a success! It confirmed our suspicion that CO2 levels are quite a major problem, which goes mostly unnoticed. As for the CO2 levels, anything above 1000 ppm is already considered problematic. You can clearly see the breaks (the rapid drops). The top levels over 2000 ppm are really something to watch for. Overall, the conference was one of the more interesting ones I’ve been at. It was a step deeper into the IoT territory and the malfunctioning sensor situation and resulting improvisation gave the whole trip a feel of adventure. Let’s see whether we’ll meet in London next year!